This article describes how to implement a preferred pricing policy on a per SKU basis or as Jet refers to it, "map_implementation". Some SKU's or brands have restrictions for what a product can be listed and sold for on various marketplaces. We offer the ability to implement the preferred pricing policy on a per SKU basis- or as Jet refers to it, "map_implementation". Make sure to save your changes! 101: No price control: No restrictions on displayed product pricing or Jet member savings on the product. This setting is the normal setting used for most products. 102: Minimum Advertised Pricing (MAP): Jet member savings for the product are never advertised and are only visible to logged in Jet members after they specifically request to reveal savings. This value can be used when complying with a manufacturer's Minimum Advertised Price (MAP) policy. 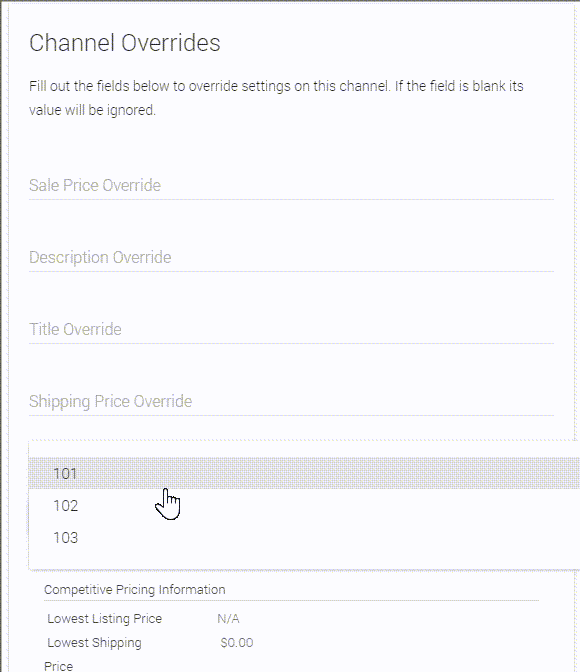 The API map_price field must also be used when using this setting as it is needed to display a price for advertising and initial presentation to the consumer. 103: Minimum Selling Price (MSP): Jet member savings never applied to product and product orders never awarded to retailer if Jet item price is below item price sent by retailer. This value can be used when complying with a manufacturer's Unilateral Minimum Retail Price Policy. This policy setting will restrict the ability to win an order for a product if the retailer item price sent is above Jet's item price shown to the consumer.